With Spring in the air - almost, I can't wait to see the flowers in my garden bloom. I love to cut flowers and arrange them. And one of my favourite containers to use for fresh flowers is a mint julep cup. 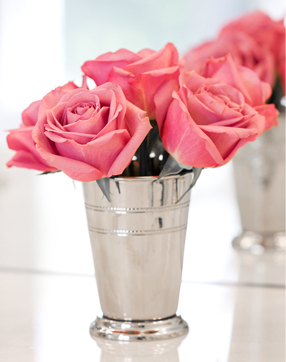 Originally designed to hold the classic southern mint julep cocktail, this cup is perfect for a small bouquet of flowers. Its silver finish and small size (5- 6 inches high), creates a very elegant arrangement which can be used on a bedside table, bathroom vanity or sitting on a stack of books on a coffee table. I like to use 3 and line them down the middle of my dining table. Inexpensive daisies and green mums never looked better! They also look pretty with just one type of flower. Cut the stems short so just the head of the flower shows above the rim. 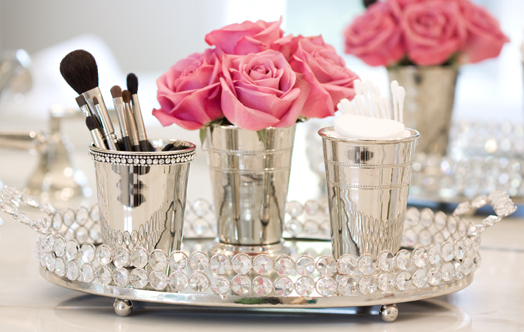 I use them to hold pens on my desk, as well as make-up brushes and cotton balls in my bathroom. And why not use them for veggies...? Mint julep cups are one of my staple flower containers and right now are waiting for my flowers to bloom.